If you have a walkway or patio that turns into an ice skating rink in winter you need to do something about it. 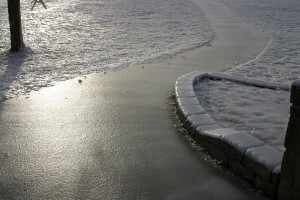 The ice isn’t only a slipping hazard, but can also damage your pavement or patio pavers. If cleaning your gutters to prevent overflow, and repositioning you downspout doesn’t work, you may need to install a drainage system. 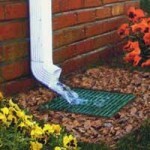 A dry well drainage system can help keep your yard and walkway clear of water, and is easy to install. What is a Dry Well Drainage System? A dry well drainage system is an empty underground structure meant to hold water until it can naturally dissipate into the ground. In America we use perforated plastic to make the structure of the well, and surround it in gravel and landscaping fabric to keep it draining, and stop it from clogging. You can either use the natural grade, also known as the slope, of your lawn for it to collect water, or run drains underground directly to the drywell. 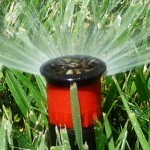 How you install your dry well drainage system depends on how you intend for it to collect water. The size and number of dry well drainage systems you use depends on the area of your roof, and your average amount of rainfall. This can be calculated by a yard drainage landscaping specialist. If you’re planning on using the grade of your lawn to gather water you need to make sure it’s placed at the lowest point in your yard, and at least ten feet away from any structure. You may need to change the grading of your yard if there isn’t an area for the water to drain to. Once you’ve found the place, dig a pit large enough to fit your dry well and gravel. Four feet deep and four feet wide is the average size for the system. Once the pit is dug, line it with landscaping fabric to prevent soil from clogging the stones and drywell, leave some overlapping the pit so you can cover the stones or gravel. When you’re finished digging and lining the pit, put the dry well together and knockout out all of the drainage holes around its surface. Next fill the pit with six inches of stone. Put the dry well into the pit and center it before filling in the pit around the dry well with stone until you reach its top edge. Finally fit the surface drain and overflow emitter onto the top, cover the dry well and gravel with the left over fabric, and burry everything but the surface drain with soil and sod. Installing a dry well system with underground drains is very similar. The difference is that you dig trenches with a downward slope from your downspout to your dry well. You then connect the downspout to the drywell with corrugated plastic and 4 inch plastic pipe and cover it with dirt. 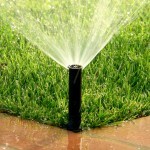 If done correctly the water should run straight down your downspout through the pipe and into the dry well. Need Help Installing A Dry Well Drainage System? 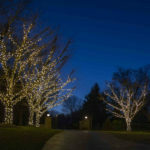 If you need a drainage system but can’t install it yourself Aqua-Bright Irrigation and Illumination can help. To talk to someone about winter basement waterproofing, and winter yard drainage, in Baltimore, Maryland or the surrounding areas, call Aqua-Bright today at 410-489-9009 or take a tour through our website. 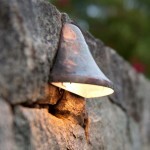 This entry was posted on Thursday, February 26th, 2015	at 7:22 pm	. You can follow any responses to this entry through the RSS 2.0	feed. Both comments and pings are currently closed.